The average adult reads between 200 and 300 words per minute. People who enjoy reading typically read above 400 words per minute. Many people read at speeds above 800 words per minute and still maintain excellent comprehension. Boost Your Reading Speed… Without Sacrificing Comprehension! It really is possible to read faster, get more done, and have time the what’s important to you. Abby’s Rev It Up Reading Online Speed Reading Course teaches you proven speed reading techniques that will boost your productivity and enjoyment…guaranteed! It ONLY takes 5 Hours! There are 9 instructional modules, each taking between 30-45 minutes each – for a total of JUST 5 hours. Email course creator anytime using the EMAIL button provided on the online speed reading course screen to get your pressing questions answered! 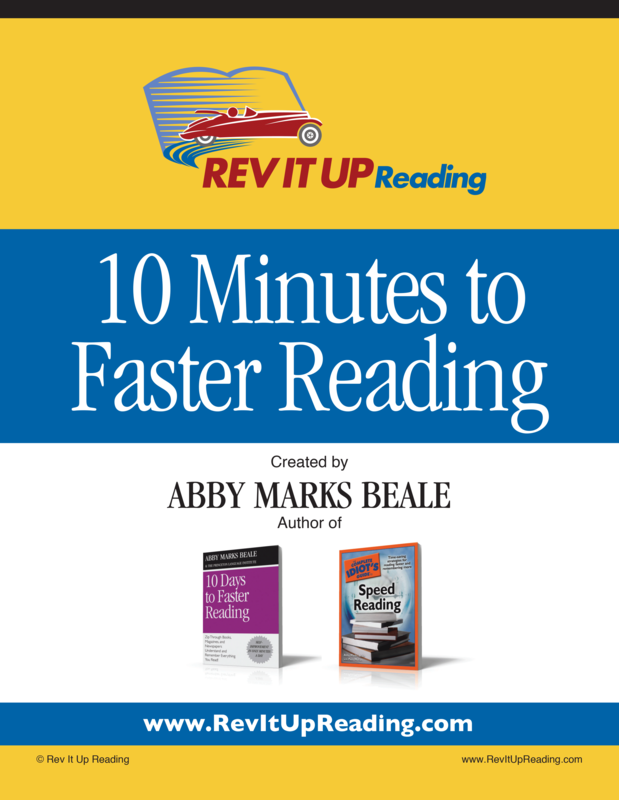 You will be learning from Abby Marks Beale – America’s #1 Speed Reading Expert – who has written, not one but TWO, best-selling books on speed reading: The Complete Idiot’s Guide to Speed Reading and 10 Days to Faster Reading. You track your own progress through 17 timed reading exercises and a self-evaluation of habits assessment. … But if life gets in the way you can purchase an extension for a discount.